The Mentor a Planning Student (MAPS) program is a partnered initiative between the University of South Florida Master of Urban and Regional Planning Program (USF MURP) and the APA Florida Chapter Sun Coast Section. Originally launched in 2015, the program has successfully matched over 100 planners and students, benefitting students and the local planning community. Perks include enhanced internship recruitment, local talent retention, and leadership development for both mentor and mentee. Many mentor-mentee matches develop a connection that extends beyond the program year and requirements, with relationships continuing as students begin their professional careers. It’s very helpful to check out other established programs as a first step. Much of the section’s program was modeled on an existing partnership between Florida State University and the APA Florida Chapter. You can look to universities, check out APA’s Chapter Best Practices and mentoring toolkit, or gain inspiration by exploring the mentoring programs of other professional organizations, Chambers of Commerce, and formal corporate mentorship initiatives. The program thrives when employers actively encourage mentor participation among staff, so we find it helpful to communicate the value and benefits of mentoring to local planning leadership. Now that word about the program has gotten out, as well as the benefits of a fresh perspective, we sometimes have more mentor volunteers than mentees. In the fall, a call for participants goes out to students and section members, and USF faculty and section leadership match mentors and mentees by their area of interest/expertise. Although the application form gathers information about participant interest, facilitating rewarding matches often means tapping into our network of relationships. If we don’t have a match for a student’s interest in our volunteer pool, we are able to leverage the section’s strong connection with its members to link them to a local professional with that expertise. 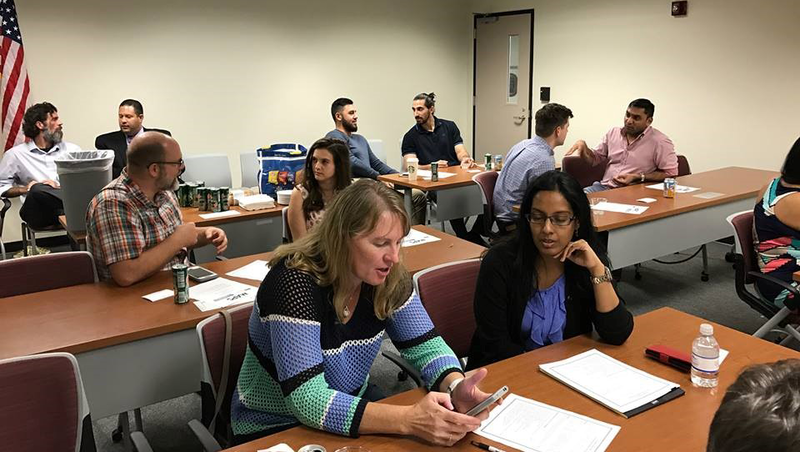 Professionals and students connect at the 2017 Mentoring a Planning Student kick off at the University of Florida with the Sun Coast Section of APA's Florida Chapter. Photo courtesy Sun Coast Section. We emphasize the fundamentals of program success early and often and provide clear expectations. We advise the professional mentors to take a lead role, recognizing that students may have limited experience, and will value mentors who are supportive and responsive. We also communicate that the relationship is not an unpaid internship or a pathway to employment. However, beyond that, we strive to provide maximum flexibility. For example, for the in-office shadowing component, students can attend an internal staff meeting, watch a board presentation, or get a backstage pass to the work involved in developing a charrette — whatever works best for both parties. The idea is to keep the program simple and accessible to busy students and professionals. We find that both students and professionals enjoy connecting in a group setting, so we kick off the program with a group meeting of all participants. Both students and professionals feel more at ease knowing that their peers will be there, and it is an opportunity to create even more connections. You never know when your mentee’s roommate might be a good candidate for your summer internship posting! We also organize a mid-year mixer where mentors and mentees can re-energize and share ideas. We evaluate the program annually through a survey of all participants. This helps us to understand what worked well and where there might be opportunities to enhance the program. We also encourage communication throughout the year to address questions and concerns. Student mentees value the program because they gain exposure to different career paths and professionals. The practitioner community enjoys the rewards of mentoring as well as the opportunity to connect with future talent. Beyond direct benefits, the program fosters other town-and-gown synergies, including opening up pathways for community-based projects and collaborative research. Additionally, it’s a great way to recruit volunteers for local planning volunteer leadership. Many USF MURP alumni now serve on the section’s executive committee and help us to plan great programming and events. Learn more about MAPS and review the application guidebook. If you don’t have a local university to partner with, APA offers a number of other opportunities to serve as a mentor. We recommend checking out the AICP Candidate Pilot Program mentor program or Mentor Match at NPC18. Top image: Mentor a Planning Student program mentor Melissa Zornitta, AICP (left), and mentee Katrina Corcoran at a 2016 networking event of the Sun Coast Section of APA's Florida Chapter. Photo courtesy APA Florida Chapter, Sun Coast Section. 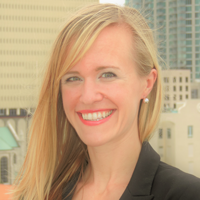 Melissa Dickens is the APA Florida Sun Coast Section chair and a senior planner with the Hillsborough County City-County Planning Commission. Dickens has over 10 years of public and private sector planning experience in the Tampa Bay area, with a background in land use and environmental planning. She has been active in Sun Coast Section leadership since 2013 and also serves on APA's Water and Planning Network Steering Committee. 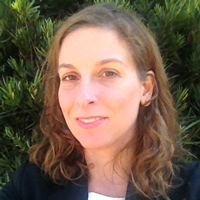 Evangeline Linkous is an assistant professor of Urban and Regional Planning at the University of South Florida. Her research focuses on land use planning and law, growth management, and rural and agricultural planning. She created and administers the MAPS mentorship program at USF.